My Five-Minute Journal Experience – Love. Life. Practice. Gotta admit, it’s a pretty book. 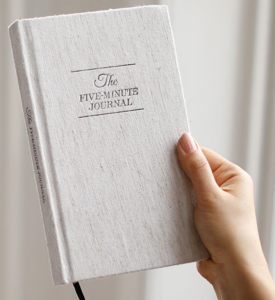 I mentioned in the last post that I was trying out the “5 Minute Journal” technique for five days (which is kind of their “challenge” for skeptics). I am definitely one of those skeptics, due to the overwhelming amount of optimism that falls into their formula. Write three things you are grateful for. Write three things that will make it a great day. Write the “Awesome 3”: three good things that happened. Think of your “Time Machine” moment (which I’ve taken to calling “the Tardis Moment”): if you could go back in time and change one thing, what would it be? This is just the bare bones – you should really check out their website “fiveminutejournal.com” for the full scoop. While you don’t have to use their neat printed volume (I use a Field Notebook) you certainly could do worse in terms of quality journaling, and their tips and explanations help flesh out the concept. While I started out skeptical, I was amazed at how quickly this process improved my general life. My productive nature made me naturally try to accomplish the “great day” tasks, which both was fun and also automatically made my answer to How’s your day? turn into “Great!” The affirmation was also surprisingly helpful in shielding me from some of my usual hangups, and the “Tardis Moment” kept me from feeling like this whole thing was just a saccharine exercise in rose-colored journaling. The biggest change, though, came when I woke up on day 2. I lay there in bed, thinking What are my three things going to be? both for gratitude and for “great day.” With a shock, I realized that I was really looking forward to not only writing in the journal (for all of 60 seconds) but to making that “great day” happen. In other words, I was actively creating a better life for myself. All from a few little lists. I’ll be talking, along with my partner Natasha (who also has been trying this out), about the experience of the five-day challenge on the Weekend Roundup Podcast. If you have any questions for us to address, please leave them in the comments! I know someone who did this with their love life. He and his wife were struggling to connect so they did this, verbally, in bed in the morning and at night. It worked. For a while, but as humans are wont to do, they stopped finding time for it.